Waterfront Osterville home on West Bay surrounded by water & spetacular views! Spend your next vacation at this beautiful waterfront property. Located on spectacular West Bay in Cape Cod's premiere vacation destination. Take in the views from the expansive deck or walk your own stretch of pristine West Bay shoreline. West Bay is perfect for swimming, kayaking, clamming, fishing, or simply enjoying the natural beauty offered by Cape Cod. A ideal property for entertaining. Location: minutes from downtown Osterville, Dowses beach, shopping, fine dinning, golf, and tennis. Convenience & Privacy all in one:: Located just minutes from Wianno Yacht Club, Wianno Golf Course and the center of Osterville. This property offers convenience being within walking distance from town with great restaurants and shops. For the savvy shopper, Mashpee Commons is located less than 9 miles away. Or if you prefer a more active vacation, partake in a few day trips by visiting a local winery less than 15 miles away, take a ferry or plane over to Nantucket and Martha's Vineyard. Either way, you’ll simply bask in the beauty that abounds here. This idyllic spot is ideal for taking in sunrises and sunsets and simply sitting back and doing nothing. Even those that aren’t avid bird watchers will be mesmerized with the Blue Heron that frequently calls this area home. To plan your list of activities and determine driving distances you can search the Internet by 02655 zip code. Surrounded by beautiful West Bay! We spent two wonderful weeks at this very special vacation spot. 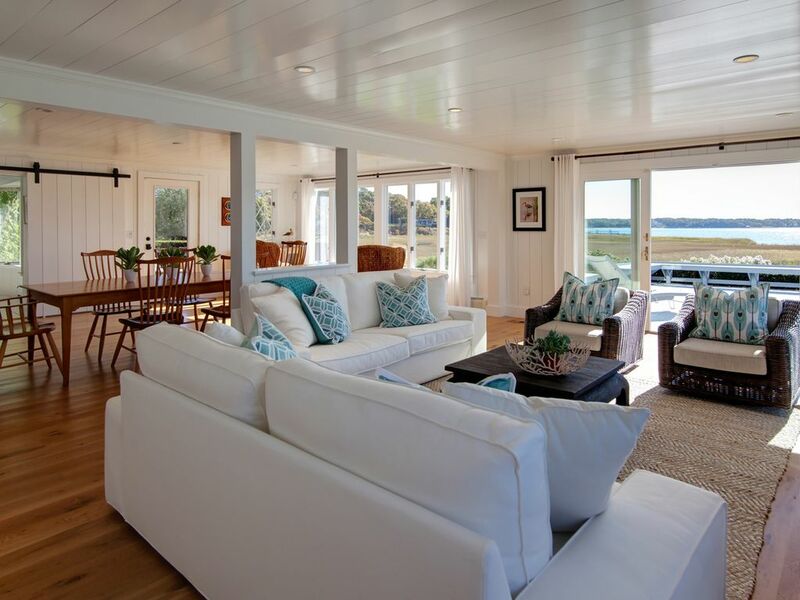 The house is spacious, open, bright with sliding doors overlooking the large deck and the scenic bay. Although everything we needed was right there, we enjoyed all that the village offers. The accommodations were very comfortable and well presented. Our stay was fun, relaxing and memorable; everything that we hoped for in a great vacation! Thank you for your attention to every detail and all you provided to create a wonderful experience. I would definately recommend this lovely home to friends and family with water views from every room - a great entertaining home. There is a huge deck which lends itself to outdoor dining and cocktail parties. For those seeking solitude - peace and quiet, this is the perfect getaway. It is one mile to town, restaurants and shopping. Beaches are nearby but one can swim in the bay facing the home. And for those who love the great outdoors it is so fun to watch the sailboat regattas passing and there are many different species of birds - great blue herons, osprey, egrets and many more - this is the spot. It is awesome to watch osprey fishing and whistling away in the tree. We had great fun clamming for our dinner. And - the owner could not be more gracious. Enjoy all that Osterville and Cape Cod have to offer in the fall and winter. Available for long term winter rental, small corporate retreats, small family reunions. Email or call owner for more information and special pricing options!